Hidden in trees on the steep fellside above Seathwaite in upper Borrowdale are the few surface remains of mines where a very valuable mineral was dug from inside the mountain. In 1582 William Camden's tour of the North of England spoke of "these famous mine of wad or black lead.'' The Wad in question being a very pure form of graphite. Its use in facing the inside of casting moulds for cannonand musket balls led to its value soaring in the 17th century as England Holland and France flexed their military muscle and generated something of an arms race. The earliest use of the wad was merely for marking the thousands of sheep that the monks of Furness Abbey grazed across the lakeland fells. In the late 16th century "wad holes'' were described as being worked. And the records show that even at that early stage seven tons of the best quality graphite was valued at 13 pounds sterling per ton. The other use of graphite, in pencils, was another factor in its growing value. In 1580 and 1602 there is evidence that Flemish traders were supplying the Michaelangelo School of Art in Italy with Cumberland graphite. The mine was dug by the German miners who came over as part of the Company of Mines Royal set up in Keswick in the mid 16th century. The Hochstetter family were involved in the wad mining and applied their German mining techniques. Many tunnels are a characteristic coffin profile and the marks of primitive wedge splitting of the rocks are visible. The rock was so hard that it could take a week to dig just a few feet forward. As the miners dug deeper into the hard volcanic rocks seeking out the graphite deposits they had to dig adits or levels to drain water out of the mine. As with our own OPEC oil producers the mine owners tried to control the market by shutting down production after such large finds. But in 1710 the re-opening of one mine after a length shutdown uncovered the fact that thieves had got into the mine and dug out all the valuable wad. It was the high value that led to tight security at the mines and Hugh Walpole's series of historical novels on the Lakes include scenes drawn around the smuggling and handling of illegal wad.. Best wad reached �00 per ton at one stage and miners were closely watched and searched when leaving the mine. One smuggler was called Black Sal (allegedly hunted to death by hounds) and another character was William Hetherington who pretended to be digging a copper mine, but had a secret concealed door that led through to wad deposits he dug underneath his neighbour's holding. In 1751 there was an exchange of gunfire between security men and smugglers.This led to the 1752 Act of George 2nd for which stealing or receiving wad was made a felony punishable by whipping and year's hard labour-or seven years transportation. One discovery of a wad deposit yielded �,000 worth. The war demands of the Napoleonic Wars were great but the demand for wad was eased when in 1758 the ironmaster Isaac Wilkinson, who had been in Cumbria at Backbarrow and possibly at Bigrigg, patented a method of casting in dry sand. But as the need for the wad in castings dropped it grew for the use in pencils. By 1800 the mine had expanded with a complex of buildings at the mine entrance. Here miners had to change under the close scrutiny of security guards. Jacob Banks and others started pencil making in Keswick. The Napoleonic conflict also led to the French being deprived of Cumbrian graphite. Thus Napoleon appointed an army officer to come up with a solution. This was the mixing of graphite powder with clay. This product became the norm and demand for quality wad dropped dramatically.By 1891 the mines were abandoned for good. Ironically had the greasy black mineral that was graphite been slightly more compressed by the geological forces there could easily have been diamonds in them there hills. 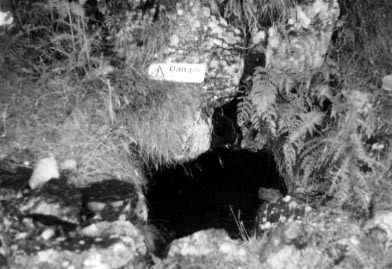 Pictured The overgrown entrance to part of the wad mines above the Borrowdale valley.